Philadelphia’s Dr. Dog has been churning out jangly, earnest pop with a less-than-subtle nod to classic influences such as Neil Young, The Band, The Beach Boys, etc. for six records. And on its seventh, it seems, the group seems content to continue down that same path. And there lies the problem that Dr. Dog has struggled with, at least in the eyes of their critics, for most of their career. They make really solid music that is legitimately enjoyable to listen to, but for one reason or another it’s nearly impossible not to be distracted by how much you are aware of their influences. It’s not the worst problem to have, but a problem nonetheless, especially after seven records. Void does however make a few cases for the band having its own identity. First single “Old Black Hole” combines jammy hand drums and a psychedelic soundscape with McMicken’s effortless delivery sounding somewhere between Brian Wilson and Wayne Coyne. 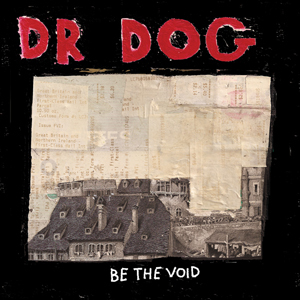 It sounds like, well, Dr. Dog—quirky, catchy, controlled chaos. “Heavy Light,” a breezy mashup of styles with McMicken wishing “I gave only love,” is another example of what the band is capable of, but the distorted riffs of “Warrior Man” and bouncy piano of “How Long Must I Wait?” dip back into pretty familiar classic rock territory. Good songs, but not particularly memorable. After seven records, Dr. Dog is a band that is going to be who it is going to be as a long as it’s together—a more than capable rock band that puts out reliable, if slightly underwhelming records, and Be The Void doesn’t make too strong an argument for the contrary.